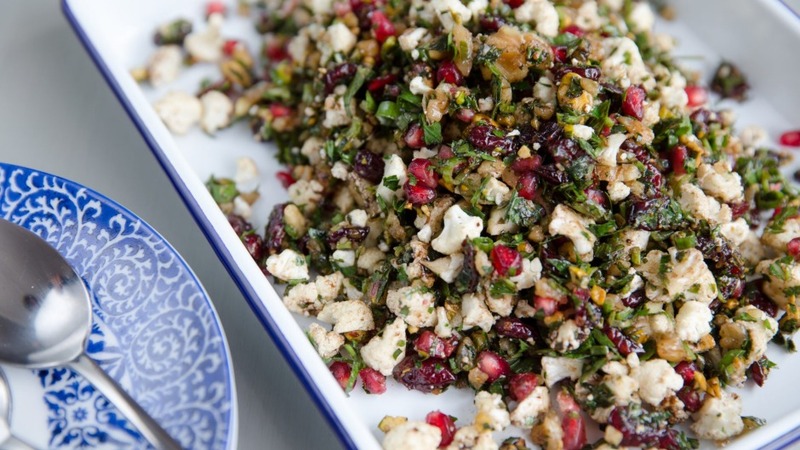 This festive salad is one of the signature dishes of Sydney's Kepos Street Kitchen, says creator Michael Rantissi. We reckon he's on to a good thing. 1. Place the pearl barley in a large saucepan of cold water. Bring to the boil over high heat. Reduce heat to medium and cook for 40 minutes or until tender, then drain and refresh in cold water. 2. Blanch the cauliflower in boiling salted water for one minute, then drain and refresh in cold water. 3. In a large bowl, combine the pearl barley, cauliflower, pomegranate seeds, cranberries, nuts and herbs. 4. Whisk the oil, vinegar and pomegranate molasses together in a small bowl, season to taste with salt and pepper, and pour dressing over the cauliflower salad. Stir gently to combine, then serve.